Copper investment castings are normally made by sodium silicate Lost Wax Casting process. 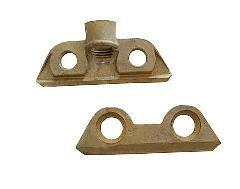 It includes two types: brass and bronze investment casting. Both materials has excellent mechanical property and corrosion resistance so that copper investment casting is used in a variety of industries and applications, including metering, fluid power, hardware and locks, power generation, artistic pursuits and many others. C83600, C86300, C86500, C92200, C95200, C95800, CA836, 80-5-5-5. Weight: From 0.003kg to 35kg. According to the customer request. Uses the CNC machine tools to process each kind of component, widespread application used in military industry, shipbuilding industry, aerospace, machinery parts, medical equipment, arts and crafts, and other fields.